Singing is difficult for many reasons, but one of the hardest things to deal with is how personal our voices are to every individual singer. Each voice is unique to that person, and as such, singers have an extra level of difficulty to deal with when learning how to use their instruments. 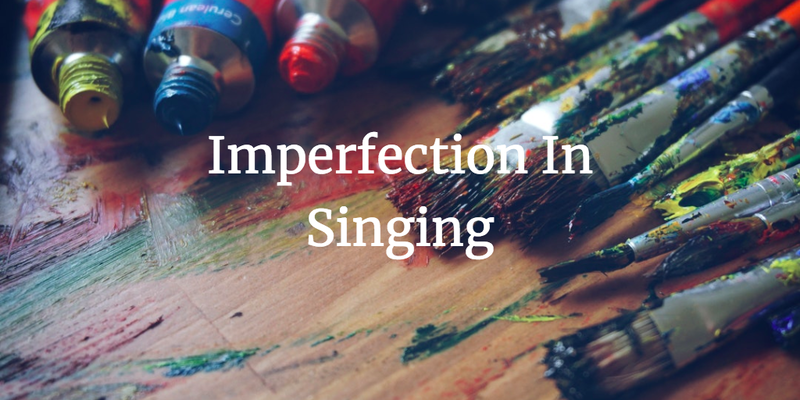 Here are three ways to deal with imperfection in singing. Making a mistake in singing, or having your voice not respond in the way you’d like shouldn’t be considered a source of embarrassment. Our voices don’t come out of a manufacturing plant, or a production line, as many other instruments do. Our instruments are also not only affected by weather, and temperature, but also by the food we consume, and even how we’re feeling each day. This means that from day to day our voices can sound different. ‘Mistakes’ or variations in our voices are not only expected, but natural, which is why we spend a lot of time discussing how to manage our voices, instead of trying to control them. Sometimes, what seems like an imperfection actually becomes a part of something new. Take pitch bending for example. In Classical music, singing in tune, with a high degree of accuracy is essential. ‘Scooping’ (dragging sound from one note to another) is not regarded as good technique. However, in pop music, and much of jazz, scooping, or pitch bending is considered essential, and is a skill to be developed in its own right! What is regarded as imperfection in one style, can be essential in another style! The individuality, and unique quality of our voices, which can sometimes feel imperfect, because they do not conform to any one sound, actually contribute to making our music feel more human. There is plenty of research to show how positively humans are conditioned to react to the sound of human voices, even from the womb. This means that the very imperfections, which we sometimes criticize ourselves for, are the very things that set our instruments apart from others, as well as what makes people so intrigued by, and musically responsive to, the human voice. What are some other tips to helps us with imperfection in singing? Tell us in the comments below!